Are you trying hard to make kids take up your saving advice seriously? Hand them these wholesale custom keychain piggy banks offered in bulk at extremely cheaper prices. Kids will be happier to carry it on their bags or within their pencil boxes and will not mind even showing them to whoever they meet. These piggy keychains will help your brand go to places without even actually going there. Avail attractive price benefits on bulk orders of these customized keychain piggy banks. Our prices will keep you covered for artwork assistance and online design proof. 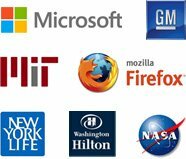 We offer 100% customer satisfaction guarantee and 110% lowest price guarantee. 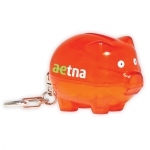 These promotional piggy bank keychains can be availed in attractive colors and you can choose to imprint them with your brand slogan and logo in the colors of your choice. These incredibly affordable promotional key chains are perfect for distribution throughout the year because it is something that can be given on any day and on any occasion. These custom keychains will easily do the job of promoting your organization and inspiring kids and their parents. It doesn't matter whether you decide to promote your brand logo or brand name over it, kids will still love them. You can gift these piggy keychains as individual gifts or combine them with other promotional giveaways for kids. Whatever be the reason and occasion to gift, your young recipients will accept them with grace. It allows them to keep their keys and changes safe. 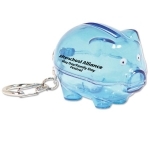 Being compact sized, you can transport these logo piggy keychains in bulk to your next tradeshow venue. 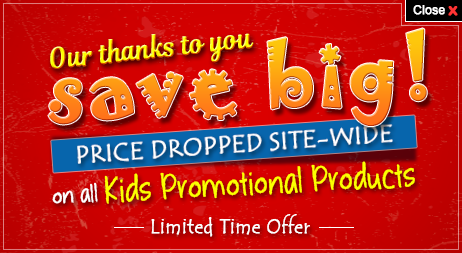 Call us at 855-454-3786 or email us at info@promo4kids.com to know about this product and place your order. Our product experts will help you to understand the promotional benefits of these piggy keychains or other promotional giveaways for kids. Our graphic team are working very hard to ensure that your brand logo will look exactly the same on these piggy keychains or on other shape and selection banks.